C-SPAN is pleased to announce the winning documentaries in C-SPAN's 2019 StudentCam competition! Congratulations to Mason Daugherty & Eli Scott of McKinney, TX on winning StudentCam 2019's Grand Prize, and Ella Grace Rodriguez, Justin Whittingham & Luke Sand from Winter Park, FL on winning this year's "Fan Favorite" award. Thank you to all who participated and congratulations to all of the winning filmmakers! This year students in grades 6-12 were asked to create a short (5-6 minute) video documentary on a topic related to the new 2019 competition theme, "What does it mean to be American? Choose a constitutional right, national characteristic, or historic event and explain how it defines the American experience." Video should evaluate how this right, characteristic or event is upheld in our society, or challenged by current events. Rights or characteristics may include aspects of democracy, opportunity, liberty, justice, equality, diversity, unity, individualism, other rights, guiding principles, or shared values. The competition is open to all students in grades 6-12. Grades 6-8 compete in the Middle School category, and grades 9-12 compete in the High School category. For more information, visit our Prizes page. Documentaries must include clips of supporting or opposing C-SPAN video that relate to the chosen topic. Winning StudentCam documentaries will thoroughly explore a variety of viewpoints related to the chosen topic, including those that may oppose the filmmakers points of view. We recommend that you interview experts on your chosen subject. Documentaries must be between 5-6 minutes in length. *End credits, if applicable, must begin after the 5-minute mark but are permitted to run longer than the allotted 6-minute time frame. Entries must include either end credits or a works cited list. For the complete list of competition rules, click here. Key dates, including the submission deadline and the announcement of winning videos. Submission deadline for all StudentCam 2019 documentaries. 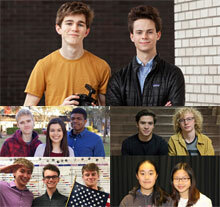 The 150 winning entries in the 2019 StudentCam competition were announced. Each of the top 21 winning entries will air at 6:50am ET and throughout the day on C-SPAN Networks.